The PSAT is a two-hour test administered to all O’Dea sophomores and juniors in October. It is given at O’Dea on our testing day in October. The Counselors give the scores to the students as soon as we receive them, which is usually in late December or early January. Along with the scores, each student will receive his test booklet, which he can use to review those questions he answered incorrectly. This is a great place to start when a student begins to prepare for the SAT Test. The score report sheet itself thoroughly explains the meaning of the scores and extensive statistical data pertinent to national performance. The scores are reported on a scale of 20-80 points for the three test categories of Math, Critical Reading and Writing Skills. The scores for the PSAT tests are normed for sophomores and for juniors. The PSAT test that students take in junior year is also the National Merit Scholarship Qualifying Test. The NMSQT determines a Selection Index score, which is the sum of the three test scores. By attaining a high “Selection Index” juniors may then qualify for National Merit Foundation recognition and scholarships. This places them in competition with all of the juniors in Washington who take the PSAT test. For the class of 2010, the National Merit Foundation conferred the semi-finalist status on those with a Selection Index of 217 or better. The National Merit Foundation provides the counseling office with a new qualification number each year, usually by the end of summer. O’Dea semi-finalists are notified of their standing in late September. How should I prepare for the SAT or ACT? There are many different formats that can be utilized to improve your scores on the standardized tests. Test Preparation for the SAT should begin about six weeks before the scheduled test so that the “tricks of the trade” are fresh. We recommend that juniors complete all of their testing by the end of junior year. Most students do the test in the winter and spring of junior year. We also recommend that the juniors take two SAT exams and one ACT exam. The CollegeBoard has partnered with the Khan Academy to offer free SAT test preparation. This is a great resource for students who work well independently. Preparation Books –These can be accessed at the public libraries or purchased at Borders, Barnes & Noble, University Bookstore etc. You should use your full legal name so that it matches your high school data, which will be used on all of your transcripts. Your full legal name is what appears on your birth certificate and social security card. What is my high school code? You must use your social security number when you complete the Free Application for Federal Student Aid (FAFSA) but you do not have to use your social security number for the standardized tests. If you do not have one now, it is important for you to obtain one immediately so that you can apply for financial aid. You can get a social security number by contacting your local social security office or call 1-800-772-1213 or go to www.ssa.gov/online/ss-5.html. Do I have to fill out the student descriptive questionnaire? This is an optional section but it provides useful information to the colleges who then use the information to send materials to students who may be a “fit” for their institution. We recommend that you complete this at least one time. How do colleges get my score? You can send the score reports to a maximum of four colleges without extra fees if you indicate the schools at the time of registration. For the SAT scores, you have the option to use Score Choice and send selected test date scores to the colleges but we recommend that you send all of your scores to each college to which you are applying. See the Score Choice section for further explanation. The ACT report will only include the results from the current testing. The O’Dea High School transcripts do not include any test scores so you must have your scores sent to all of your colleges from the testing companies. If you need your scores sent to colleges that you did not indicate on your registration after you have tested, you can request this through your online account that you created when you registered for the SAT or ACT. There is an additional fee for sending scores to more than four schools at the time of registration and for sending scores after you have taken the test. Those additional fees are $12.00 per college for ACT and $12.00 per college for SAT. How do I register for the standardized tests? You can register online or with a paper form. The most efficient way to register is online (www.collegeboard.com for SAT; www.act.org for ACT). You will know exactly where you will be testing and for the SAT you will print out your admission “ticket” at the time of registration. You will need a credit card to register online. If you do not have access to a computer, you can mail a paper form. We have all of the paper registration materials in the counseling office. You should register early for each test as the testing sites fill very quickly. Are there fee waivers for the SAT and ACT? Fee waivers are available to high school juniors and seniors who cannot afford the SAT and ACT test fees. There are ACT fee waivers, which cover the cost of the basic fee and the writing fee if you choose to take the writing test. SAT Fee waivers cover the basic testing fees for the SAT Reasoning Test or the SAT Subject Tests and either the Questions and Answer Service or the Student Answer Services. Eligible students may use up to two SAT Reasoning fee waivers and up to two SAT Subject Tests fee waivers. The use of SAT or ACT fee waivers may qualify you for up to four college application fee waivers and a fee waiver for the NCAA Eligibility Center. Fee Waivers cover only the cost of the basic fee, the student must pay any standby, site change, date change, test change and late fees. Please see Mrs. Eulberg if you need any fee waivers. How can I get accommodations for standardized testing? If you receive any accommodations at O’Dea High School, you may be eligible for those same accommodations for the SAT and ACT tests. You must speak to Mrs. Popich early in junior year, as there is an extensive application process to complete in order for you to receive them. What do all of the registration deadlines mean? What if I am sick on my scheduled testing day? If you are unable to take the test on the day that you registered for, you will have to contact SAT or ACT to submit a date change to a different testing day. You will be billed an additional fee ($25.00 – ACT, $29.00 – SAT) for a date change. I was assigned to testing center that is far from my home. Can I change sites? You can change testing center by going to a different testing center early (6:45-7:00am). You may want to call the testing center and get specific instructions on this process. You will be placed on a list and after all of the registered students have been admitted, if there are extra test booklets you will be allowed to test. You will be billed an additional fee ($25.00- ACT, $29.00-SAT) for a test center change. I registered for the SAT Reasoning Test but I need to change to the SAT Subject Tests. How do I do that? You can change the test (you can also change from the SAT Subject Tests to the SAT Reasoning Test) when you check in at the testing center. If they have extra tests for the test you wish to change to, you will be assigned to the new test. You will be billed for an additional fee ($29.00-SAT) for a test change. What shouldn’t I bring to the testing room? Almost 700 colleges, including some highly selective colleges, accept the Common Application in lieu of their own application forms. By endorsing and becoming members of the Common Application organization, colleges vouch for the fact that the Common Application will not be evaluated or valued any differently than their own individual applications. The Common Application is available online at www.commonapp.org. From this website, you can download an application, complete and submit an application, download or submit supplemental forms. Students complete one application and then they can submit that application to every Common Application college to which they wish to apply. In addition, colleges may have some questions that are specific to their college, which the student must complete as a Supplement. It is vital that you check for any Supplements for each college that you will send the common application. 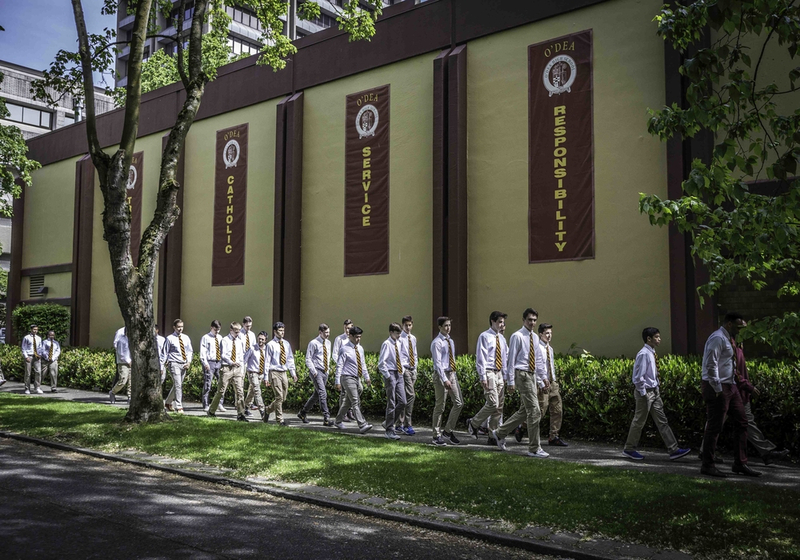 The Common Application and Family Connection are linked together which means that O’Dea is able to submit transcripts and letters of recommendation electronically. I want to play my sport in college. What do I need to do? “Choose the school, not the team” is advice that we strongly support. It is easy to be dazzled by an exciting sports program or a “great” coach. However, remember the ultimate reason that you are attending college is for the academic programs. Why academics?? Consider what remains if a career-ending injury occurs, the “great” coach leaves, or the exciting team is a bad fit. Academic programs remain constant. A good strategy for student-athletes is to consider the sport as just one aspect in their college search. One of the most important factors in assessing the student’s college athletic options is to honestly evaluate his skills and interests. Athletes who overrate their abilities may be set up for disappointment. The coach of the O’Dea team or the select team coach may be able to help determine which division best reflects the student’s abilities. Athletes who are considering Division I or II schools must fulfill all of the NCAA requirements by the time of graduation from O’Dea. The NCAA requires that athletes have completed a core curriculum of 16 core courses with a minimum grade point average (GPA) and a minimum SAT or ACT score. Athletes who do not meet these requirements may not be eligible to compete. There are many other NCAA regulations that are also involved in the recruiting process. These rules apply to both the student-athlete and to the colleges. It is imperative that the student and his family become knowledgeable about these rules as any transgression may jeopardize the student’s participation on the college team. All of this information is available on the NCAA Eligibility Center website. You should print a copy of the Guide for the College Bound Student-Athlete, which is located on the NCAA website. It will give you specific information about the minimum high school academic requirements and the regulations that you must follow during the recruiting process. I heard that as soon as I turn 18 years old, I need to register with the Selective Service. How do I do that? Almost all male U.S. citizens, and male aliens living in the U.S., who are 18 through 25, are required to register with Selective Service. It’s important to know that even though he is registered, a man will not automatically be inducted into the military. In a crisis requiring a draft, men would be called in sequence determined by random lottery number and year of birth. Then, they would be examined for mental, physical and moral fitness by the military before being deferred or exempted from military service or inducted into the Armed Forces. You can register online at: https://www.sss.gov/RegVer/wfRegistration.aspx. I have forgotten my ID and password for the PowerSchool student and/or parent portal, how can I get that? We have a single sign on process for all of the important applications that you will be using. You were given this information when you enrolled at O’Dea. If you need help, please email Mrs. Verzemnieks, our registrar. I can’t remember my username and password for Family Connection, how can I it? Email Mrs. Verzemnieks and she can send you your login information.